Help for your Sweet Tooth Attack! At my office, we are always discussing our Sweet Tooth urges and constant battle to fight a growing waistline. I was very happy to host a sampling and drawing for Yoplait Delights recently. These delicious parfaits have two luscious layers that pack a double dose of rich and creamy yogurt with 100 calories and 1.5 grams of fat per serving! We sampled Chocolate Raspberry. The other yummy flavors to check out are Crème Caramel, Triple Berry Crème, Chocolate Éclair, Cherry Cheesecake, and Lemon Torte. What more could you ask for? Isabel D. was the drawing winner, and will be receiving the awesome prize pack shown above - an “Indulgent Escape” gift pack that includes a chocolate-scented candle, insulated tote, coupon for a free pack of Yoplait Delights, and an aromatherapy eye pillow. Congrats, Isabel! Yoplait provided me with free product, information, and giveaway through MyBlogSpark. Congratulations Isobel!! That is one nice package you just won!! We have tried Yoplait before and my daughter liked it! Congrats! My husband and daughter both really likes yogurt. These are a great alternative to fattening desserts! Grabbing some of these on my next grocery store trip. Congrats to the winner, guess I will have to buy them to try them! I do not mind as their products are usually very good. I used to buy this but not anymore. I'll settle with my fresh fruit smoothies. Congratulations to the winner! I eat yogurt every single day so I appreciate low cal food. Hmn, Parfait! I liked it,one of my favorite and Yoplait is our kind of yogurt. Hmmmm... that looks good. I used to buy some Yoplait products, but I don't anymore. I buy something else instead. That definitely is a sweet tooth's delight. :) Good luck! 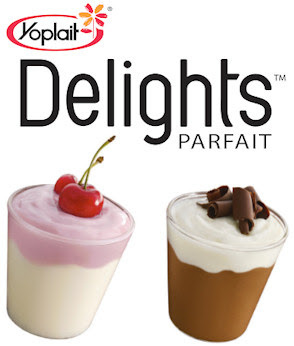 We love this parfait from yoplait too! This is hubby's favorite and he loves the creme caramel.